We all hear it and maybe even say it. 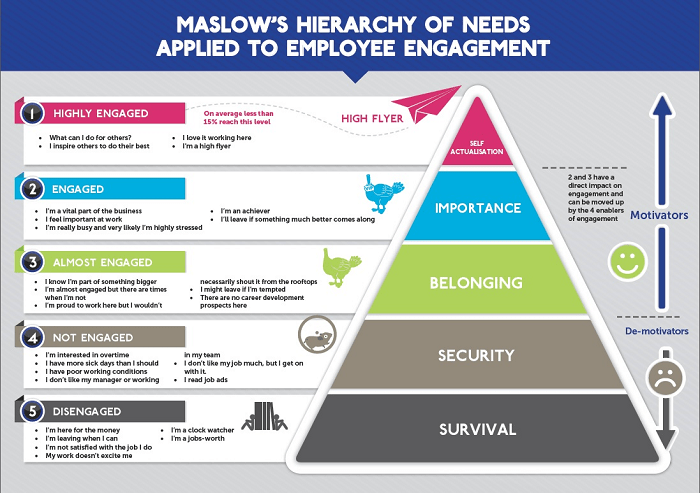 “Our people are our most valuable asset.” It’s cliché and true. But many who know it or say it do not realize, or maximize that value. The statistics reveal a huge problem, and opportunity. A 2015 Gallup Poll indicates only 32.9% of the US workforce are “engaged.” 50.3% are “disengaged.” And alarmingly, 16.8% are “actively disengaged.” I say alarmingly because actively disengaged can actually be a destructive influence. According to dalecarnegie.com, companies with engaged employees outperform those without by up to 202%. There are many reasons for that, but let’s start with how to realize the value of our employees. In professional or creative services businesses, are people are absolutely the most valuable assets. There is likely no physical asset or intellectual property of financial value. Your people are your client acquirers, sale makers, revenue generators, and business operators and managers. So for professional and creative service firms, it is a more significant truth and important to maximize the value of your people. Volumes have been written and spoken about recruiting and hiring. But I suggest you keep these two things in mind about finding talent that are the “right fit.” First, share your and your business’ mission or purpose with potential candidates. Find talent that knows, believes in, and wants to commit to why you and your business do what they do. If they believe in and be inspired by it, they will commit out of self-interest, which will coincide with your and your business’ interests. That is more than half the battle and removes most of the risk of a bad hire. Of course, you want candidates that have a track record of relevant accomplishment that substantiates or demonstrates they “can do because they have done.” It is this criterion that is most relevant. Trying to subjectively assess how “smart” a candidate is, or projecting their performance based on the arbitrary assessment of the prestige of their undergrad or grad school, is not an effective methodology for determining a good fit or projecting performance and achievement. Plenty of impressively schooled and degreed, “smart” people underperform and underachieve, while those that do not possess those same superficial credentials, but believe in you and your business and commit their passion and talent, most often exceed expectations. For your people to have no limits on their ability to think and act on your and the business’ behalf, they need to be informed. They need to know your and your business’ vision, mission or purpose, values, strategy, plans, customers, success criteria, and state of the business. That means you must have these conceptual assets in place and available. Second, by communicating, referencing, and reinforcing them through behavior and activity, your people will know, understand, and feel your business. They will know how to perform with confidence and speed, and minimal management or supervision. They will be brand evangelists, able to effectively attract and engage relevant stakeholders wherever and whenever they encounter the opportunity. A fully informed work force creates a culture of openness, honesty, respect, and trust. A trusting workforce almost can’t help be successful. A workforce that lacks trust requires expensive oversight and conflict resolution, and suffers from ongoing reduction in quality and speed, up through and to the point of failure. If you have made the investment in your people, make sure they have available the resources they want and need to be effective. This can vary from business to business, but usually involves compensation, direction and support, other complimentary teammates, workspace, technology, processes and systems. Having an ongoing evaluation of work activity to identify obstacles to and opportunities for maximum contribution and achievement, a process of continual improvement, is a worthwhile investment that pays for itself many times over. If you have an informed and equipped team, make sure they know what accomplishments and impact are expected of them. They are engaged to accomplish, not just execute tasks and activities. Be explicit. Create performance agreements that generate their commitment to achievement. Confirm your mutual understanding, and commitment. Emphasize that doing their best whenever the opportunity presents itself is not going “above and beyond,” it is their duty and their commitment. And if they are informed, and equipped, and qualified for their job, they will likely happily make and fulfill that commitment. Last, make sure each employee has and realizes they have both the necessary authority to and responsibility for their contribution and achievement. And ensure they now the consequences for and for not fulfilling their commitment, not as a threat or to manipulate by fear of failure, but so they know the context, purpose, and importance of their role and how it impacts success. Informed, equipped, empowered, accountable employees are inspired by the challenge, enjoy the journey, and are rewarded and fulfilled by the collective and individual success. It can be awe-inspiring to witness or be a part of a workforce that is informed, equipped, empowered and accountable. The culture is positive, collaborate, confident, optimistic, fearless, and highly productive. It can be the stuff of an exceptionally successful business, and quality of life.